In late December 2016, as the farm season began to die down I sat down with a close friend and co-worker of mine Brody McAllister to talk about his thoughts on food culture these days. Today, Brody is very active in the food community around Baltimore, working on his own farm Darlin' Corey Farm, helping Chesapeake Farm-to-Table when he can, and as the Sourcing Specialist at Millstone Cellars. [*Note I work closely with Brody on a daily basis at Millstone Cellars]. We sat down in his farm house for over an hour talking about farm life, his background, his inspiration, and what he thinks some of the biggest challenges are to the sustainable food movement. Brody is thoughtful, opinionated, and knowledgable about what makes the Baltimore-area community special, but also vulnerable. The conversation started with discussions about dogs and family, but suddenly dove deep into the fabric that guides our food decisions. Welcome to our new series called Thoughts from the Grange. A series of sit-down interviews with young farmers and food entrepreneurs. We are hoping to catch a glimpse of what the future of food has to offer. This interview was recorded on December 21st, 2016. ZACH - When did you become interested in farming? BRODY - It is a long story... (pause for laughs) ...I started gardening when I was 16. 15... 16 something like that. I was probably interested in it before. My great grandparents they got this house during the Great Depression. Started homesteading off of it and then two generations after that... post industrial era into technological era that’s when I was born… early 1990s. We kind of lost it through there but somewhere in between I don’t know where it came from, I decided I wanted to garden and started gardening around here and then moved across the country working on different farms and in herbal communities. ZACH - ...and realized you wanted to come back and farm? BRODY - Yeah, basically over time. I went to school for botany and worked on farms for six years. ZACH - It was meant to happen… What is it about farming that you love? Is it being able to interact with nature? BRODY - Yes the freedom of lifestyle, and to be in one place, and not have to separate myself from life, work, and play. They are tied into one place. They are all one system working together. They don’t need to be separated. I don’t believe in work and I don’t believe in play. That’s just life. It is a thing you do, you just go. ZACH - Darlin’ Corey Farm is what you are calling your farm? BRODY - Yes… for now. We just couldn’t wait. ZACH - It became more than just providing for yourself. That came about from just deciding you wanted to sell to others, restaurants, and... ? BRODY - Yeah I mean restaurants... I like the idea of restaurants and I like that restaurants are starting to source from local farmers, but that it not my main goal in the long run. I should say ours, it’s with my partner Alison. Selling directly to the community I find a lot more important. It gives people more of a connection to place themselves because I think that is a big problem. Especially here in northern Baltimore County we get a lot of transplants that work desk jobs and aren’t experiencing nature on a normal day basis and have this disconnect from it. When they eat local foods it brings them back to that place and I think that is very important. Then the cooking aspect of it. Creativity within each individual, we have lost that. We are very “we need it now, we need it now.” No you don’t, take your time, experience it, respect it, enjoy it. Giving that back to the people is very important. Restaurants they help pay the bills, that’s where that’s at. ZACH - So CSAs and farmers markets are more of your focus? So selling directly to your community? ZACH - Do you think CSAs are important for farmers? Financially and culturally? BRODY - I think yes. I don’t think they are going to last forever. For farmers right now, we have that 2 generation loss between pre-industrial era to post industrial era where we have kind of lost the small farmer. I forget the President’s name right now... (*Earl Butz) but someone said “get big or get out” to the agricultural industry. It might have been earlier than the 70s, but now we are coming back around to where small farmers are becoming more and more important which I think is a very important thing, but everyone has their opinions. *Earl Butz - The Secretary of Agriculture under Richard Nixon and Gerald Ford. ZACH - So you were talking about CSAs going away eventually, you think that the culture behind supporting the local farmer will overcome that environment? BRODY - I think you could see more market environments, like in other smaller countries that are more self-sufficient in the market environment. Rather than one person buying it at the beginning and going through… Gives more people freedom of choice. ZACH - And you’ll always have restaurants, other things, and cideries. Clearly mushrooms are also a big thing for you. What do you like about mushrooms? 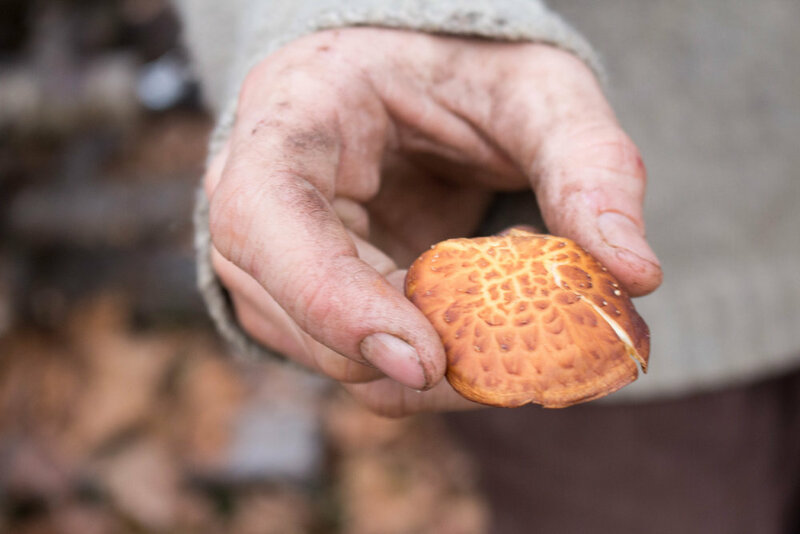 How many different types of wild edibles and mushrooms are available to you in Maryland? BRODY - Numbers that’s hard to say. ZACH - Is it something, where there is so much diversity that it is something that you’re interested in? BRODY - Both of them with using them as models for restaurants, CSAs, and markets. It’s hard in Maryland, I am going to say that. Mushrooms I love, because when you get a good flush you can tell by the weather patterns. I have my spots just like any good mushroom hunter will have. Not saying I am a good mushroom hunter, I am still learning as all of us are. There’s a consistency that goes along with it which is really nice and it is something different for people to eat. But this state that we are in has been so disturbed for many many many years. Basically, since our anglo-saxon ancestors came here, the pilgrimage across from Europe, we have been disturbing it since then. With the amount of development, we don’t have old growth forests so we don’t have the diversity that we used to. So it is fragile. ZACH - But do you think foraging has role in food systems in the future? Could it contribute a lot? BRODY - It does and I do with invasive plants as a key to that. Especially in this region. This region especially, I have lived in so many places around the country, it’s hard to like know exactly. ZACH - Because it is so different per area? BRODY - Yeah, like down in Asheville, they are surrounded by five national forests, you have millions of acres to work with and a lot of stuff that hasn’t been very heavily touched. Where here, it’s like everyone’s backyard is discontent with that and “I want to get rid of that”, or I am driving to work and I am going to be a seed disperser. There are places out there where you don’t touch. That have been very lightly touched. So it is hard to say in general. But this area, invasives are very important, just because it has been disturbed. Invasives are opportunistic creatures, they take advantage of places that have soil disturbance, nutrient deficiency, or what it may be, which we have lots of those problems, or opportunities depending on what plant you are. ...So I would say focusing on those garlic mustard, Japanese barberry, nutweed or Japanese nutweed, there are a lot of Japanese invasives that are well suited for our temperate ecosystem that have been transported through global transport of some sort. They have no competitors. We become those competitors. ZACH - You work for Chesapeake Farm-to-Table, transporting some of your products to restaurants, do you think these cooperatives are important for the food system moving forward? Do you think it helps farmers out? Is it “value-added” to farmers? BRODY - Yeah, most definitely. I think it definitely helps a farmer out. It is very important to farmers for the sake of, as a very young company it personally is important for the excess that we have, if we don’t get rid of it in markets and things like that, but over time I think it could be one of our main focuses. I think it is good for the community and the restaurants just because it gives them the opportunity to see what is actually out there instead of the farmer having to go door-to-door to every restaurant around to try to find somebody who wants their radishes or something. ZACH - I feel like they are also a credible source, if I go to Chesapeake Farm-to-Table I know I can trust them as a part of the cooperative. BRODY - Jack and Becky Gurley of Calvert Gift’s Farm, there are the ones who started it, and they have been doing this [farming organically] for 25 years I think in this area. They do farm tours and their whole thing to make sure that credible farms are coming in. So it is important thing, that credibility. They are also working on Chesapeake Farm-to-Home now which I am super excited about. I think that will be maybe not as steady as Chesapeake Farm-to-Table but it is going directly to consumer. ZACH - So directly to your community is very important to you. BRODY - Yes, absolutely. Take out as many middle men as you can. ZACH - Do you think farming has made you more environmentally conscious? Or has it always worked both ways in your mind? I became more environmentally conscious when I went to college and learned about it more. When did that switch turn on in your mind? BRODY - I feel like I always had a connection with it at a young age. My family is a pretty environmentally conscious group of people, especially the older generation. I grew up with my grandmother in the house we are sitting in and this was her’s that she was homesteading off of. Everyday we got off from school, she would be sitting in her rocking chair, watching the birds, and it would just be a story about the birds that day. I was like “cool,” so I would become very interested in that and then I eventually go into plants and all that stuff. So it has always kind of been ingrained deep into me. School definitely made things a lot more concrete, I could understand the science behind it. I had always had an appreciation for this place, this big ol’ rock we are hanging out on, but once you get to know the intricacies then my interests got locked in. Everyday you observe something new and it’s like wow I actually understand this in practice. I see the changes through time. ZACH - You are also interested in medicinal herbs. Is that something you learned in school? Did it pique your interests in terms of how it works with food? ZACH - What you saying is you may kill two birds with one stone? You can both eat food with valuable nutrition and medicinal benefits. BRODY - Yeah people just have to learn about it. ZACH - Yeah I do not think it is well understood. The germinal potential… I love that little statement. The potential of germination is on the periphery. That’s where we are. We are out in the country. That is where growth happens. You have lots of ideas and ideals that build within the city, but the actual growth comes from the country. You don’t have timber, you don’t have oil, you don’t have your food, you don’t have your stone, or any of these things or goods that build up a city center. The potential comes from the country, and we allow this to happen. If you do not have these people working within these systems then you do not have the city. You don’t have these ideas or ideals. There is no longer potential for them. ZACH - You’re saying the potential comes from that back and forth relationship there? BRODY - They are interdependent on one another, but often times the country gets pushed aside because they are not on top of the new idea. It is slower out here. It is something you are observing constantly, but you need to nurture. While the city is… go, go, go, go, go! “My idea is better than yours, my technology is better than yours…” Well… it’s not all about being better. It takes time... we are working together. We are building and working together as a system. These same ideas need to germinate more in the city rather than having all of this separatism. [In the city] you are so connected that they want to be separate. While out here we are so separate that we want to be connected. There is this weird duality, that we need to integrate together. The city centers are the mainstay progression of society nowadays. I think the city needs to start to take some of these agrarian roots from the people who are actually producing for life to progress within those centers. ZACH - You probably sell most of your food to Baltimore? ZACH - Sounds like you are definitely touching both of these worlds every day. BRODY - Most definitely… This is going to sound backwards sort of… I wish more of it went to Baltimore. I don’t like selling to restaurants, I like selling to individuals. I wish more of our stuff went to the cities because the cities don’t have the space in order to grow food. I wish I wasn’t selling so much to County folk because all of us out here have ample room to grow all the food that we need. Plus… a lot more. People choose to have their lawns. People choose to drive to the cities for their jobs, and spend their sleeping hours in their house… wasting space. Sorry to some of the people out here, but it drives me crazy. A lawn is nature under totalitarian rule is something Michael Pollan said. That is something I stand by. If you don’t grow food on that then what is the point. If you do not let it go wild you’re disrupting migration habitats for many species. Species are getting pushed further and further out. There are a lot problems that come with this encroachment of these city ideas. Convenience, yet solitude. ZACH - I feel like you’re right about this idea of convenience and solitude. That’s why I think food can be a good vehicle for bringing people together. That’s kind of why I am working on this. Bringing the country to the city, and the city out to the country. The city is starting to come out to the country. People are going to places to experience agrarianism. BRODY - It is in a tourism state. We need to get past that. BRODY - We need to get way past that. We need it to be a functioning system. We don’t want it to be considered just “land.” … I am a very opinionated person. To break me of that is going to be a hard thing. ZACH - You also work at Millstone Cellars as a sourcing specialist. BRODY - With you… (giggles). ZACH - Yes. Yes. Do you think Millstone has taught you anything as sourcing specialist? Does it show you a different angle as somebody sourcing ingredients, while you are also producing things for other people? BRODY - I most definitely have. I am still figuring out what I have learned from it. I have made a lot of great connections to different types of people and different types of farms. Being the farmer and the person with the expectation… it can be hard because I understand. I am too nice to people. It makes it hard sometimes when we don’t get things on time because I know what it takes to harvest. For example, ten pounds of spicebush berries, since that is something on top of my mind, takes a lot of work. The experience, the pay, and the level of respect that often times farmers don’t expect to feel… if I give them that respect or I offer them a higher price because I know it is worth more than what is offered in the market to pay them. I know that’s not a normal thing, but I know they appreciate it. I like being able to do that. BRODY - I hope that for future generations of sourcing specialists these ideas hold true. It has also given me perspective on pricing and bulk discounts and all that kind of stuff too, which is cool. I am still figuring it out. I am still in the middle of it. BRODY - A ton about fermentation and timing of wild foraging. I have always wild foraged, but for scale that it is used now at Millstone. Timing is now so important. If I wanted spicebush I could go at the end of the season and get all I need, but when it is for a 500 gallon batch of cider that is something completely different. I am sure if you come to me two years from now it will come full circle and I can say a learned a ton from all of that. Right now it’s just building on a process. ZACH - You are looking to farm more land, right? ZACH - Well, let’s stick to knowledge base for now. What do you want to learn? What is the next step for you? ZACH - Permaculture type things? BRODY - Basically, permaculture, food forests, things of that nature. I want food to go back to the community. I want to build these food forests for anyone to access. Whether it is me harvesting it or me planting it, it doesn’t really matter to me. I just want people to be fed. But if I could integrate the three of those together, me harvesting, someone else harvesting, and myself planting [within these wild ecosystems and forest]. I want pre-colonial forests back. This has been a heavily forested region and I want these forests back. We don’t need monoculture around here. We don’t need as many horses or horse based communities around here. They preserve the land and the area that we are in, which I respect immensely, but it is not enough… It is conserving the land, but it is not preserving the land or making the land more productive long-term. It is intense human involvement. I want to create ecosystems that feed people for the next 100 to 200 years with minimal human involvement. BRODY - I can feed myself. I can live in a tent. But food I think is going to become more and more of an issue. If I can preserve land and get land trusts built in many different ways we can build ecosystems. Build food and ecosystems for our community. That is all I want.